Whenever Eiji tells Ash that he wants to be with him, there’s a constant: Ash’s shock. 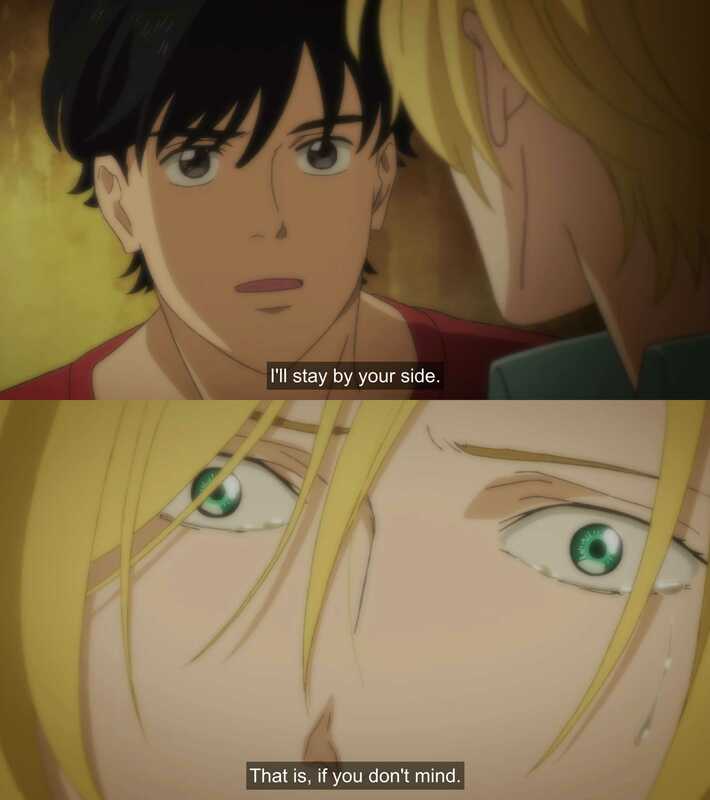 It’s there as a close-up when Eiji tells Ash he’ll “stay by his side” (if he doesn’t mind) or that he’ll “go crazy if he loses him too” (after what happened with Shorter). It’s also there in Ash’s shielded eyes and the way he pauses when Eiji asks him to come back safely, and that “he’ll wait forever” for him. All of this indicates is that, while Ash has loved and been loved before (Griffin, his friendship with Shorter), his bond with Eiji reaches a place he never even imagined existed. It’s also notable what Eiji tells him. 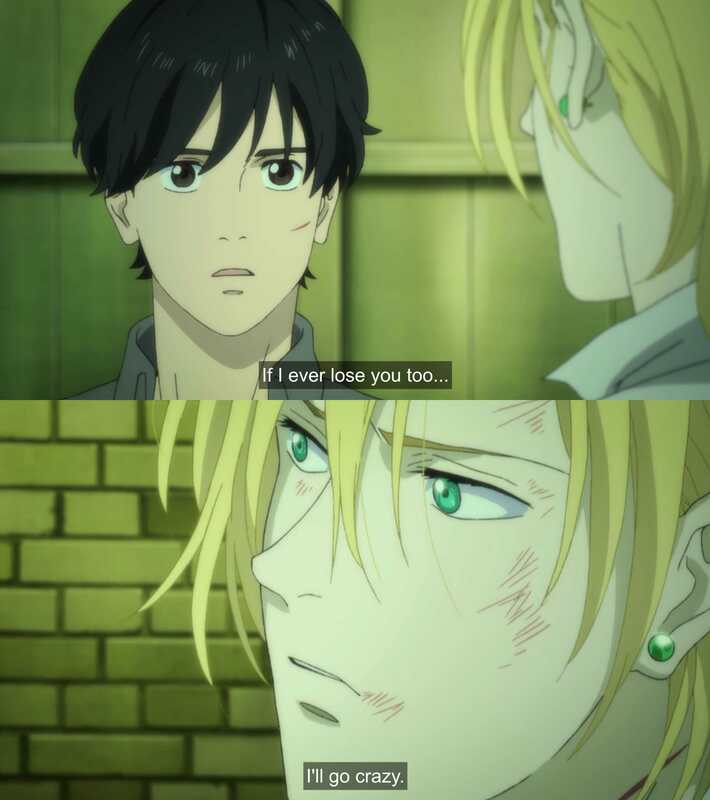 We’ve seen Ash lose a lot of people, but here we have Eiji, constantly telling him that he wants to be by his side, that he wants to stay, just because he cares about him. I take it back. I’m sad. Ash tells us as much in a scene that’s heartbreaking for multiple reasons, when he begs Blanca to please “don’t hurt him.” Just knowing that Eiji cares about him is “the happiest feeling in the world,” and with his actions, Ash tells us that he wouldn’t change that for anything. Blanca literally tells him that he just has to “give up that one thing” (Eiji) to have “everything” (money, power, etc), which is messed up for a whole lot of reasons, but I digress. Ash wants to be with Eiji, but the constantly dangerous situations they are in make him battle and repress his feelings. He pretty much tells Eiji that “the people from his world” wouldn’t let him have a relationship, and he tries to send Eiji back to Japan against the wishes of both. However, when Ash faces Eiji’s feelings, he’s unable to turn away. This struggle is perhaps more notable when they reunite after Ash escapes from “the hospital” and looks for Eiji, concerned for his safety. There’s focus on their feet, showing movement and intimacy commonly associated with kisses. We then see Eiji hugging Ash, relieved and content to see him safe. Ash moves his hands towards Eiji, hesitating for a second before embracing him. Still, the only thing stronger than Ash’s desire to be with Eiji is his desire to keep Eiji safe. We have seen Ash being reckless and self-destructive plenty of time before, sometimes for the sake of his goals. In contrast, we’ve also seen how vulnerable he gets when those he loves are attacked. This is all on display when Eiji’s life is targeted. This was on my mind when Ash vows to never let anyone hurt Eiji. He gets close, but he always gives Eiji’s space. He kneels in front of Eiji’s bed in a position that brings to mind vulnerability and reverence. 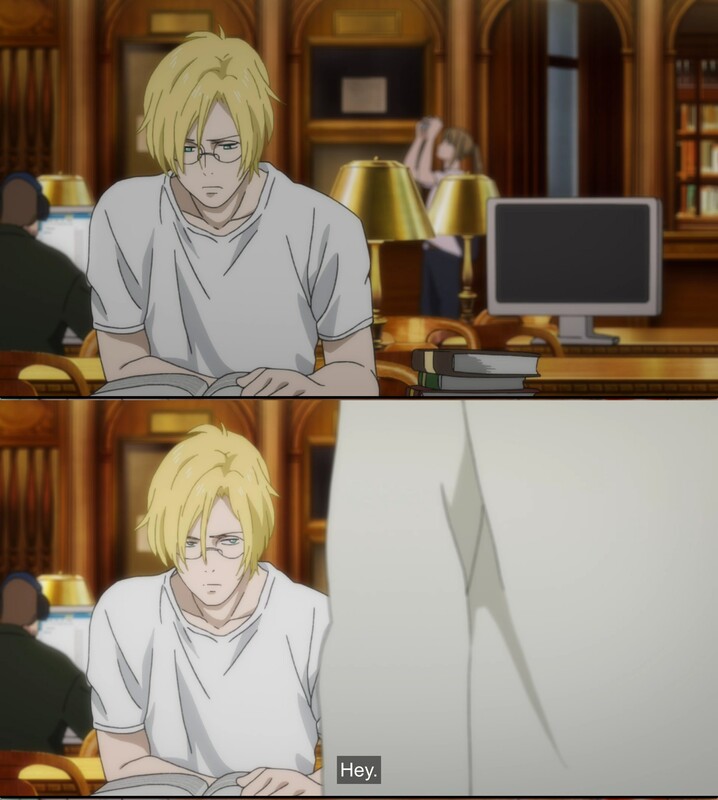 When he seeks some comfort–almost as if he needed to put Eiji close to him–he grabs Eiji’s sheet instead. It’s an intense scene that highlights Ash’s determination and desperation, which stands in contrast to another scene that takes place in that room. Eiji talks about wanting to take Ash to Japan, and when Ash sits on Eiji’s bed willing to hear him, there’s warmness and intimacy. Surrounded by Eiji’s calming blue, they look into each other’s eyes, and there are blushed cheeks and laughter. I said Ash and Eiji bring me joy, so let’s finish this on a happier note! Based on what we have seen of their relationship, it’s clear that Eiji’s the light in Ash’s dark world. It’s not just a metaphor: visually, the show makes this literal. 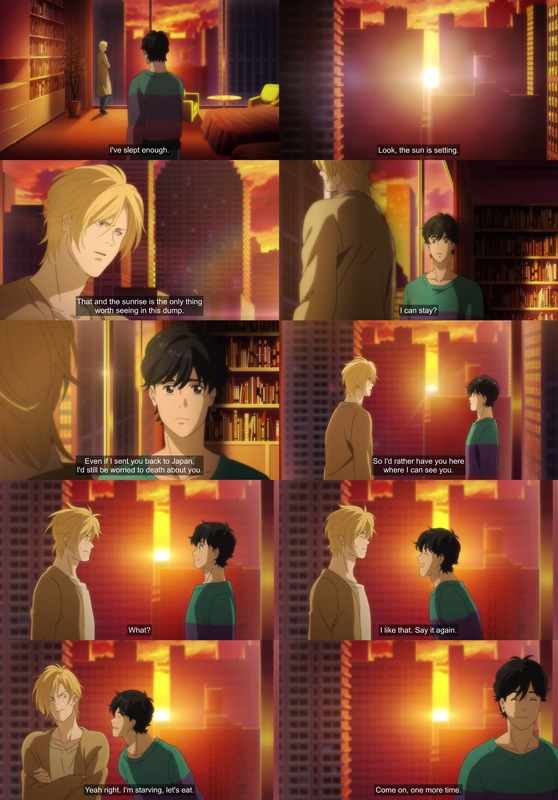 When Eiji enters the room to find Ash looking at a sunset, he overlaps the sun, establishing a connection just before Ash’s says that “that and the sunrise are the only things worth looking at.” There’s also a rainbow when Ash says that, and if previous episodes are anything to go by… Well, what else can I say except that there’s nothing straight about those rainbows. Eiji receives plenty of lighting during the entire scene, even when there are shadows present in the shot–even when said shadows cover most of Ash’s body. In turn, we see close-ups of Ash being “lighted by the sun” when we see his face after Eiji tells him he’s glad he’s safe, and when he mentions Eiji staying with him. When they face each other, the sun is closer to Eiji, rather than being in the middle. Eiji gets closer to Ash after the latter asks him “if he wants him to ask him to stay by his side again,” overlapping the sun again. Eiji answers “I like that, say it again” and his head covers the sun, making it look like the light is coming out of his smiling face. Ash gets flustered and tries to change the subject. If the blush on his cheeks doesn’t tell you anything, the visual connection and timing are clear. Eiji smiles, feeling content because Ash told him he wants him to stay with him, and in Ash’s eyes, Eiji’s as bright and as warm as the sun. Just before the scene is over, Ash’s exits the shot, leaving a gentle-looking Eiji alone with the sun just for a second, marking the connection one last time. Thank you for such a beautiful article, the analysis was simply spot on and I thought you mentioned so many things I never noticed until you pointed them out. 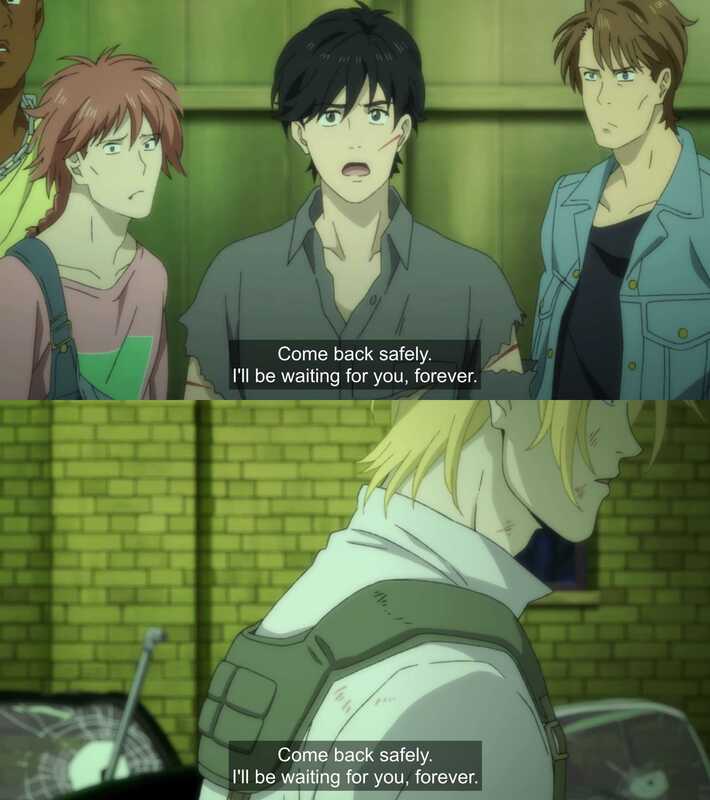 Eiji is such a pure hearted character and I’m so glad Ash got to meet him, the connection and their unconditional love between them is so rare to see. Which episode where these pictures taken from?